What are Data Driven Pages? Data Driven Pages allow you to quickly and easily create a series of layout pages from a single map document. 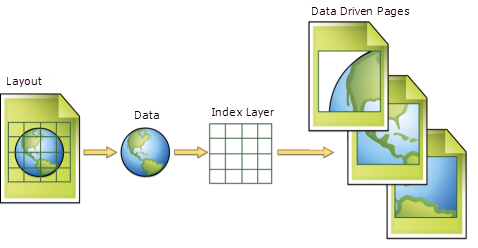 A feature layer, or index layer, divides the map into sections based on each index feature in the layer and generates one page per index feature. In order to use Data Driven Pages to build a map book you need to use Arcpy.mapping. Arcpy.mapping is a Python scripting module that is part of the ArcPy site package. This module provides functions to automate exporting and printing. 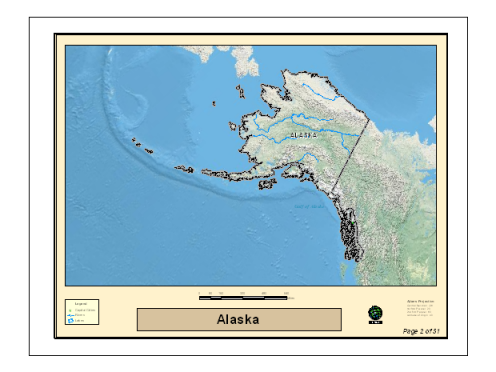 Arcpy.mapping can be used to automate map production; it extends the capabilities of Data Driven Pages and is required to build complete map books because it includes functions to export to, create, and manage PDF documents. Data Driven Pages can be based on a regular grid of polygons. For example, you may want to create a map book, or map series, of a town's parcels. Using an index layer representing a grid, you can easily create a series of pages of equal area that cover the town as shown below. 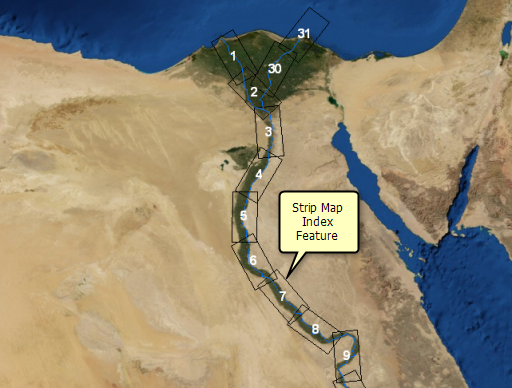 You may want to create Data Driven Pages, based on a route, such as a highway, or along a river as seen in the strip map example below. 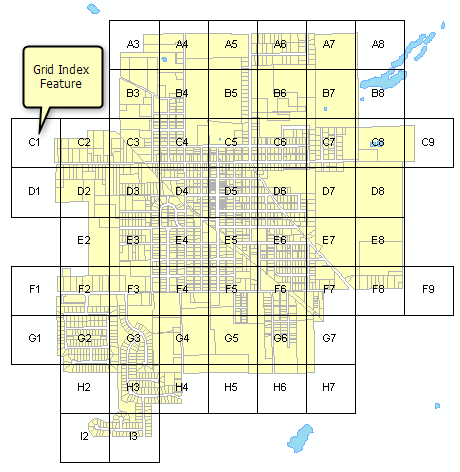 There are two geoprocessing tools, Grid Index Features and Strip Map Index Features, to help you create index layers. These tools are part of the Data Driven Pages toolset. This toolset also contains other tools to help you create a map book. These include the Calculate Adjacent Fields geoprocessing tool, which is used to create fields in your index layer that can be used to label the adjacent page in a map book; two tools to calculate spatial reference strings specific for each feature in your index, Calculate Central Meridian and Parallels and Calculate UTM Zone geoprocessing tools; and a tool, Calculate Grid Convergence Angle, that can be used to rotate each Data Driven Page to true north. For more information, see Creating Data Driven Pages. The index layer does not have to be a grid. It can be map features. For example, you can create Data Driven Pages using a polygon layer of U.S. states. In this case, a page is created for each state. You are not confined to using only polygon layers as the index layer. You can also use points and lines as long as you use a feature layer. Nonfeature layers, such as raster layers, cannot be used for the index layer. A single layout defines the map composition for each data-driven page. Only dynamic parts of the layout change with each page. Static elements stay the same. Any changes made to static elements of the layout will be reflected on each page of the map series. 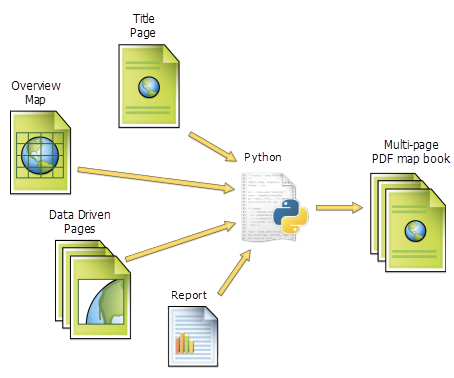 Data Driven Pages can be exported to individual graphic files or incorporated into a multipage PDF. You can print or export the entire series of pages, or you can select a subset to print or export. Many projects require multiple page sizes, multiple index layers, or nonmap information on some pages. For example, a state atlas may contain a title page, an overview map page, and a page for each county in the state. Additionally, some counties that are home to large cities also contain inset maps. 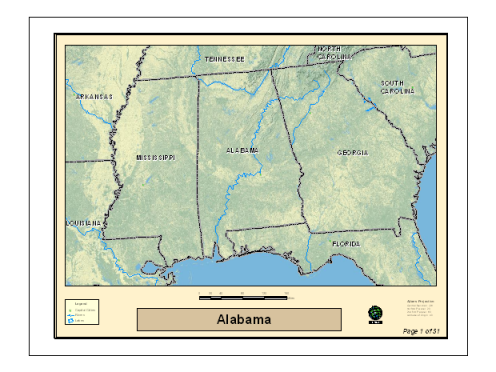 The atlas can be built using separate MXDs for the overview or index map page, pages containing the inset maps, and the remaining maps.